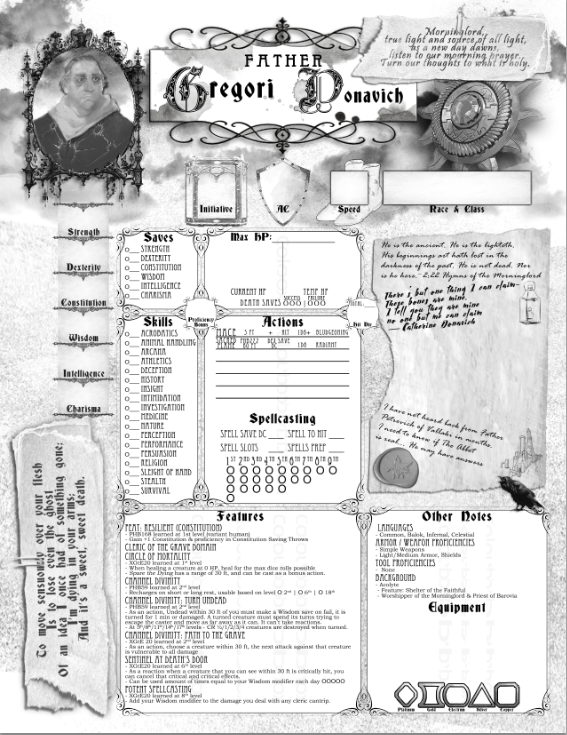 I created a unique character sheet for a Curse of Strahd campaign I'm playing in and thought I'd share it with the community! It took me about a day or so to get everything put together and I'm really happy with how it turned out. I have not made a spell page simply because my character is a cleric and it's easier to keep those on my phone or tablet. If there is enough interest, I'd make a spell page. Here is my character sheet as an example! I prefer to write in certain parts so I left some stuff out. DUNGEONS & DRAGONS, D&D, Wizards of the Coast, Forgotten Realms, Ravenloft, Eberron, the dragon ampersand, and all other Wizards of the Coast product names, and their respective logos are trademarks of Wizards of the Coast in the USA and other countries. All other original material in this work is copyright  by Steven Essig and published under the Community Content Agreement for Dungeon Masters Guild. So I just bought this and it is saying "The resource is not found." I don't know if I'm just stupid or maybe something went wrong with the upload? I really like this character sheet. I plan on using it for my Curse of Strahd campaign. Odd! I'm not sure what happened to it, but I have re-uploaded it. Yes! Thank you, I realized that I locked those boxes. Not thinking about the ramifications of it being stuck there. I’ll get a new one updated 10-22-18. Hi, I love the sheet. Is there any update on the blank version I can use for printing. Just fixed it, if you put 0 or leave the ability score blank it'll 0 out the modifiers.